A tanker is ship that is designed to transport liquids in bulk. 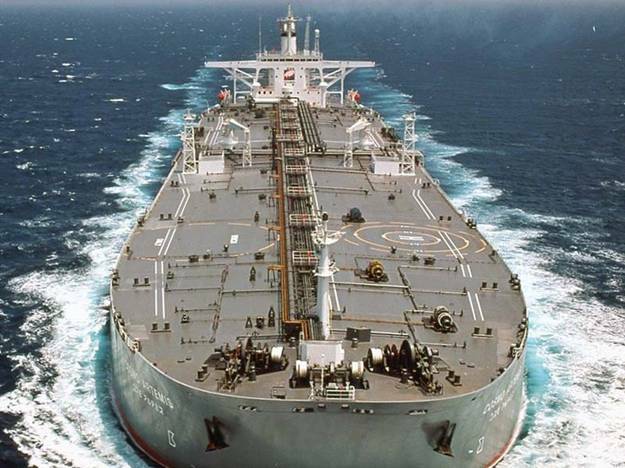 Tankers, like other ship types, are today highly specialized and exists in number of varieties and sizes. From small self propelled barges up to ULCC (ultra large crude carrier). An example of what Tankers are designed to carry is: crude oil, Petroleum, liquefied natural gas, liquefied petroleum gas, Bitumen, molasses, wine and chemicals (i.e. ammonia, chlorine). The tanker segment represents about 30% of the worlds total merchant fleet. Petroleum tankers are categorized into the following classed that determines theirs size in DWT (Dead Weight Tons). 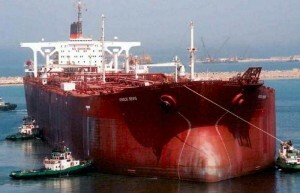 The design of Tanker ship is similar to a Bulker with the exception that the cargo holds have been replaced with tanks. Machinery either two our four stroke engines depending on size and design of the vessel. In most cases HFO (heavy fuel oil) is used as fuel for propulsion but in some cases (like on LNGs) natural gas is used instead of HFO. Design speed of the vessels is normally between 10 – 18 knots. For on- and offloading of the vessel tankers are equipped with a cargo pump system that is closely monitored due to risk of fire. Are ships that specially designed to carry asphalt/bitumen products. Characteristics of those ship is that they are designed with “floating tanks” which means that the tanks are allowed to expand due to high temperature of the product they carry, up to 260°C. Tanks are sometimes insulated to minimize heat losses. Size of a bitumen carrier is in the smaller segment (<10 000 DWT) typically between 1 000 – 6 000 DWT. Is a ship designed to supply fuel to ships offshore. Bunker tanker are smaller vessels from 100 – 5 000 dwt and the design is the sames as product tankers. Crude oil tankers are dedicated to transport crude oil from offshore oil plants (oil platforms) or oil fields to refineries. Ships in this category falls belongs to the real “giants of the sea” and the worlds largest ships could be found among crude oil tankers. The Seawise Giant, later the Happy Giant, Jahre Viking and Knock Nevis is the longest ship ever build it measured 458 meter long and 68 meter wide (beam), draght of 24,6 and depth 29,8 meters. It had a capacity of 564 763 DWT and top speed 16knots. From top speed to stop it required 8 000 meters or 5 1/2 mile. The ship is not in service anymore as it was scrapped in 2010. 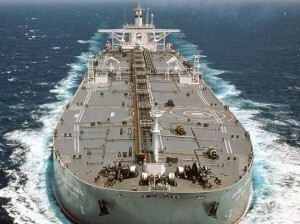 Is a ship designed for transporting refined products from the refineries such as gasoline, diesel oil and aviation fuel. Product tankers are available from small tanker barges up sizes of 170 000 DWT and is the most common tanker type. Is a ship that is designed to transport different kinds of chemicals but are also able to transport the same products as the Product Tanker. A chemical tanker is in most cases more advanced than the Product Tanker when comes to the cargo handling system as have to avoid mixing of the products it is transporting. Apart from whats been described above there a number of specialized tankers like Wine tanker, Fruit Juice Tanker, Water Tanker, Sulphur Tankers and Storage Tanker.